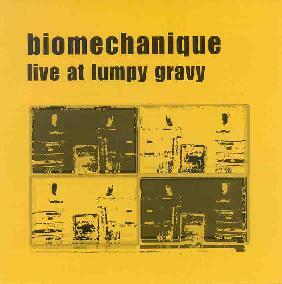 Biomechanique - "Live At Lumpy Gravy"
This is a live performance recorded in 1998 at the performance space-art gallery-restaurant called Lumpy Gravy in Los Angeles. The group is an electronic music duo of Luke Collins on turntables, effects and Korg 707 synthesizer, while Jim Goetsch plays various synths and drum machines to create seven long winding spaced out tracks. "Dub Gone Jungle" starts the CD and could be compared to some of the Bionaut material. "Ambizent" is next and has quite an intense drum machine beat with layers of more ambient synths starting the piece and then it really floats into a spaced out zone and then the drums come back in. "Breakbeat Mechanique" is a very cool ambient techno like piece. That describes the music pretty well overall but there is no intense thumping bass. The sounds from the drum machines are mainly cymbals and give an special accent that is played off the synths, samples and strange sounds and oscillations. This would be really great it if was accompanied by some cool visuals you could watch on your computer screen while it plays. A special CD by a special duo. I hope that they produce some more music like this. For more information you can visit the Psychosomatic Records web site at: http://www.psyrecords.com. Contact via snail mail c/o Psychosomatic Records; 11170 Aqua Vista St #214; Studio City, CA 91602.